Joy on the Job by Doris Helge, Ph.D.
Would you like to enjoy your work as much as a walk on a beautiful beach? You spend over one-half of your waking hours working. If you’re not having fun on the job, something’s wrong, and you can change this situation . . . more quickly and easily than you ever dreamed possible. Use proven strategies that have worked for thousands of employees around the world. Ten years of research uncovered hidden wisdom about exactly what creates happiness at work. The answers are amazing! Interviews and observations of employees and managers of 21 different organizations proved you can immediately experience greater job satisfaction. You can enjoy your job even if you have been dragging yourself out of bed in the morning and forcing yourself to go to work. These techniques work whether you are an employee or a manager. You will be successful whether you are working your dream career or a job you can’t wait to vacate. Your satisfaction is absolutely guaranteed because this book will help you experience fun and fulfillment at work right now. Here’s what others are saying about this incredible resource. Your satisfaction is absolutely guaranteed because this book will help you immediately experience more joy and fulfillment. Make a choice right now to invest $24.95 in your future so you can immediately improve every single aspect of your life! Kenneth Baker, Regional Manager, Cost Cutter, Inc.
1. How much will it cost for you to discover hundreds of ways you can increase your joy on the job right now? Less than the price of dinner for two! According to research, being happy at work will significantly improve every aspect of your life. • Your income will increase. • Your business and personal relationships will improve dramatically. • Stress will decline, so your health will be protected. • Your productivity will skyrocket. • You will enjoy your life much, much more! Bill Uhl, Senior Instructor, OHV Training and winner of six Gold medals for the U.S.
2. Can an internationally acclaimed speaker and author understand your unique challenges? Dr. Doris Helge interviewed employees and managers in 21 organizations to discover the secrets of happiness at work. 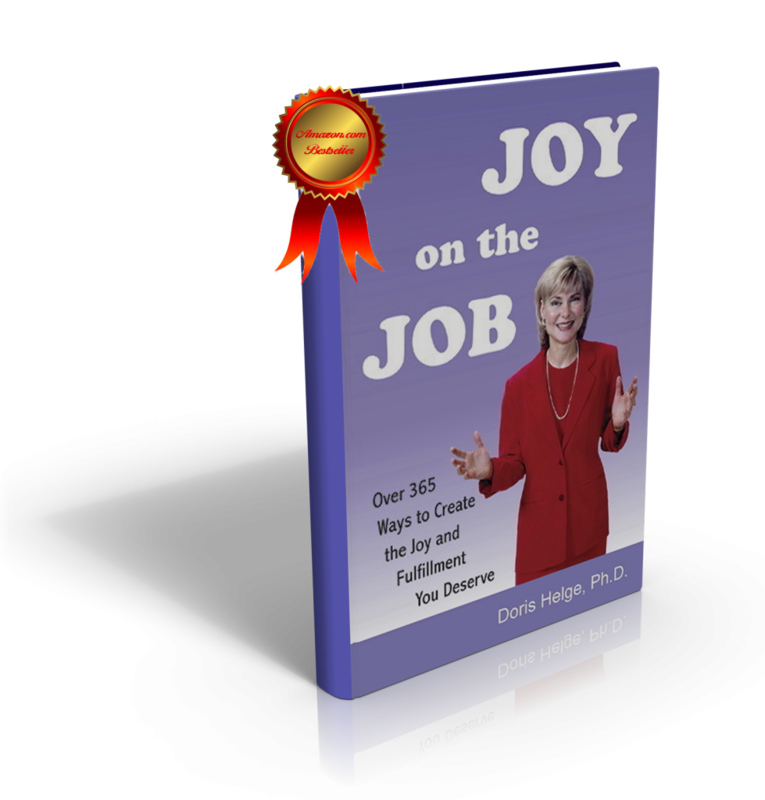 The strategies you will discover in Joy on the Job emerged from this research. These methods were then re-proven to be effective by Joy on the Job Seminar participants. They responded with rave reviews. “Can Doris understand and identify with your unique challenges? You be the judge. I first met Doris after she gave a keynote address for a national conference for occupational health personnel. A spontaneous after-hours event made me decide to become a Joy on the Job Seminar participant. Attendees from a variety of positions and industries quizzed Doris for two hours. We couldn’t fathom why she seemed to understand our specific jobs since she had never performed them. She listened attentively to everyone. She wasn’t being nice. She sincerely wanted to help us gain more job satisfaction. I was so amazed when she described the types and dates of her previous work experience that I scribbled down her answers. Unless you’re a fighter pilot or an astronaut, Doris has walked paths similar to yours. She has been a retail clerk, secretary, fundraiser, educator, and a customer service troubleshooter. She’s been a coach, grantwriter, caseworker, volunteer, and parent. She’s even been downsized! She directed a nonprofit organization. She sold ads for a journal, worked for a temporary services agency, coordinated national conferences, and has been a professor at three different universities. She’s been a researcher, counselor, editor, freelance writer, and executive director of two national membership associations. Whew! 3. How long will it take before you feel happier at work? During Joy on the Job seminars, employees and managers immediately felt happier . . . And the positive results just keep getting better and better! P.S. You deserve joy on the job right now. Discover how easy it is to use your very special and unique talents in fun, new ways. Buy this book now so you can say goodbye to stress and hello to happiness. Order now! Shipping for U.S.A. Orders is $5.00 and International Orders is $14.00. Please be sure to select which shipping method you need under the Add to Cart boxes when purchasing “Joy On The Job”. your personal and professional life? “Joy On The Job” by Doris Helge, Ph.D. for only $39.95!